Pari are female supernatural denizens of the high mountains. People in Pakistan, Afghanistan, north India and throughout Central Asia are familiar with pari. The Wakhi ethnic population in northern Pakistan, China, Tajikistan and Afghanistan have their own word for pari: mergichan. The mergichan inhabit the mergich realm, which is the realm of the mountains and high pastures. It is a pure, even sacred realm, where the supernatural mountain spirits tend their wild flocks of blue sheep and ibex. Humans only enter the mergich realm during summer, and only after ceremonially announcing to the mergichan that the people will displace them for the summer and asking them for a favorable influence on the livestock and dairy production. 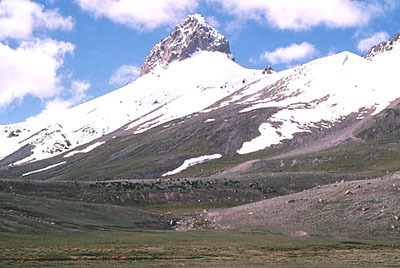 Unnamed peak rising above the Shimshal Pamir. The mergichan are not malevolent beings, but their displeasure can be provoked. They are angered by “impure” actions that pollute the mergich realm. As powerful beings, they need be propitiated to ensure the success of summer herding and dairy production by the community as a whole, and for success at hunting by individual men. The mergichan can assume the guise of a mergich animal, and in that form they can both harm and help men. Hunters cultivate a positive relationship with the mergichan and the mergich realm in order that the mergichan should reveal the location of the wild game to them through signs or through a dream. 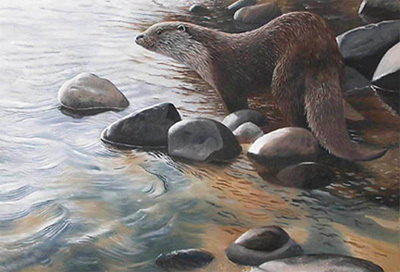 The knowledge of how to gain the favor of the mergichan includes knowledge of the habits of the wild game, the landscape within which they dwell, the vegetation they prefer for food, and a general respect and reverence for all that is mergich. From a western perspective, this seems very much like an environmental ethic. The Wakhi word for snow leopard is pes. A pes is a mergich animal found only in mergich areas. It rarely interacts with people, is hard to see, powerful, beautiful, and potentially dangerous. As such, it exemplifies many of the qualities of the mergichan, and so is an appropriate animal shape for them to assume. Currently, in the Wakhi community of Shimshal, villagers are engaged in a process of integrating their concept of mergich with a modern conservation ethic through the Shimshal Nature Trust. The younger generation sees this as a way to make the old concepts again relevant. 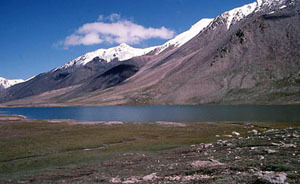 A similar process is underway in the Avgarch community in its efforts to manage the buffer zone area of the Khunjerab National Park. SLC has established partnerships with both communities, whose actions are important examples of cooperative efforts to integrate old and new knowledge into a framework that can be shared between people inside and outside the Wakhi community to develop a new significance for the mountain landscape. Here is a Wakhi story from Shimshal of how mergichan assumed the guise of a pes and became the protective spirit partner of a Wakhi man. Above Shimshal Village. This story was recorded by Dr. John Mock as part of his research activities in northern Pakistan. It is like a miracle. Someone sees something and then it vanishes. My own father, a miracle happened to him. What sort of miracle? My father went with the people to Lemarz Keshk. You’ve seen it, no? The trees below Furzin? In the evening my father went to the spring for water. When he went for water, he saw a woman with a white scarf, a pitek. He lay down into a low area so he was hidden. He stayed there a long time, looking. 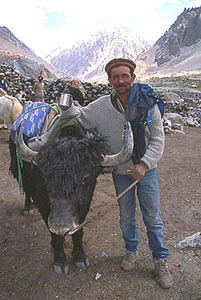 Shimshal villagers are engaged in a process of integrating their concept of mergich with a modern conservation ethic. He got up and they made a fire, and saw a lot of blood. Blood, he was bleeding. And then he was very scared. He said, “What thing was this, what happened?” They sat a while, but it didn’t come. Then they closed the door with a stone and slept. While they slept, it grabbed the door and tossed the stone aside. It came and yanked their blanket and took it. They were uncovered. It took that down to the trees. Then they got up and made a fire. “O God, what is this thing?” they said. They saw it seemed like a snow leopard. It came towards the door of the hut and his uncle was going to shoot at it when he fainted. He went unconscious and the snow leopard became a horse and went away. They sat and sat and it grew light. Their companions were at the settled area down river, where they cultivated barley. People were there for harvesting. My father came there, and said, “Someone come with us, and give us a dog, too, we were so frightened.” They refused to come. He took a dog and tied it at the door that night. He tied it by the door and at night it came again and it grabbed that dog and tossed it far away. Again it came. It came again and it wouldn’t let them sleep all night long till dawn. It took the shape of a snow leopard. It put itself into a snow leopard skin. They returned to Shimshal. There, the khalifa (spiritual leader) said that it was a pari. 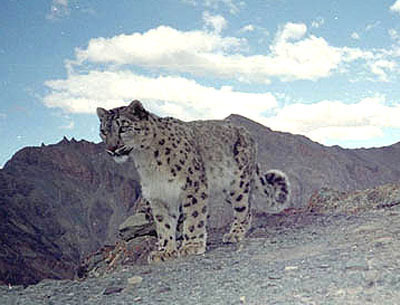 The pari itself took on the guise of a snow leopard. It took on the skin of a snow leopard and then attacked them like that. Then what happened to my father? Then it happened like this, that this pari was with him continuously, with my father. It came itself as a snow leopard. I myself and my brother Shifa, we both saw it. Our father was with us, at Arbab Purien. We were there together when it came. It came and I saw it first. I said, “Ya Ali, what thing has come? A snow leopard.” It came and stood on the far side. It stood there and didn’t come near us. It turned and left. My father was there, too. And until his dying day, that never was a danger to anyone, but to his dying day that pari was with him. A pari in the shape of a snow leopard. It would assume the shape of a snow leopard and come. That pari was ready to make friends with him. Whenever he was preparing to hunt somewhere, that pari said to him at night in a dream and told him, “In such and such place go and hunt. To such and such place don’t go and hunt, no game is there.” Whether ibex, or whether small game, he would go and it would be there. Such miraculous things happened with him. You can ask other Shimshalis if such things were or not. They will tell you. Up until his death, this was with him.